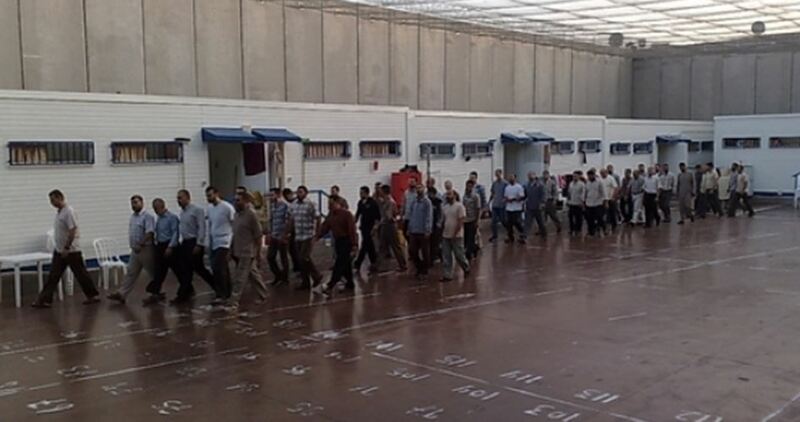 Israel’s Ministerial Committee for Legislation approved the bill, which calls for deducting welfare payments paid to the prisoners and their families from the tax revenues that Israel transfers to the PA. The bill will have to pass three readings in the Knesset plenum before it becomes law. According to Israeli news outlets, the bill would see Israel cut around NIS 1 billion ($285 million) from the annual tax revenues it allegedly hands over to the PA. The bill was initiated by opposition Yesh Atid MK Elazar Stern. The funds that Israel is planning to deduct would be funneled to Israeli settlers and settlement projects across the occupied Palestinian territories. Reacting to the decision of the Ministerial Committee for Legislation, many activists denounced the move as an act of piracy and flagrant theft of money. The approval of the bill comes in the context of the campaign of incitement and hostility waged by the occupation government against the prisoners and the families of the martyrs and wounded anti-occupation protesters. 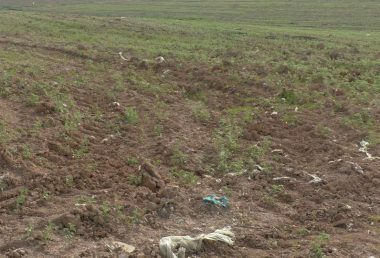 Israeli bulldozers on Monday morning leveled Palestinian lands near Rafafa settlement, illegally built on privately-owned land northwest of Salfit. 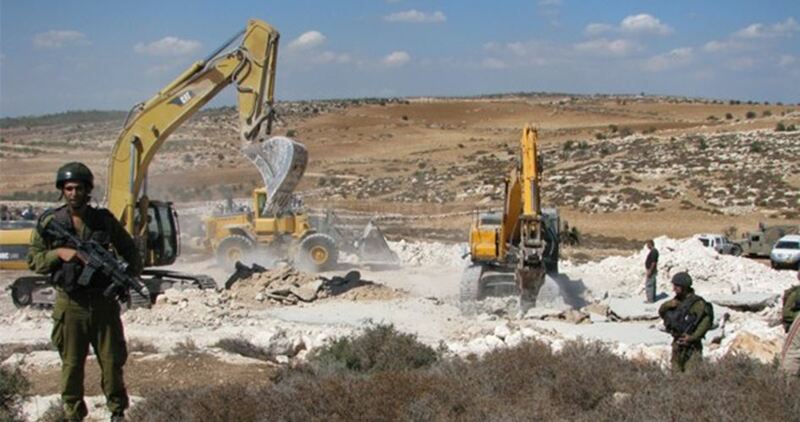 Speaking with a PIC news correspondent, eye-witnesses said Israeli bulldozers razed Palestinian lands northwest of Salfit and carried out excavations in an attempt to construct new settlement units near Rafafa’s southern corners. 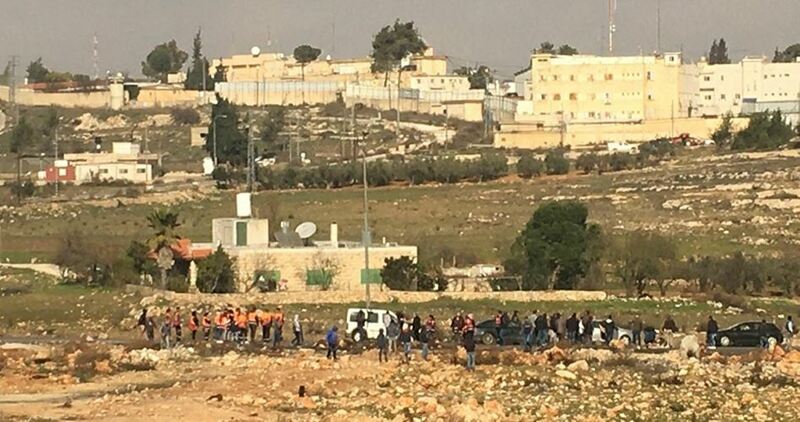 Sources from Haris town warned of underway Israeli attempts to uproot dozens of olive trees so as to expand a settler’s bypass road in the area. Expert in settlement affairs Khaled Maali said Israeli bulldozers continue to level Palestinian lands across Salfit around the clock for the benefit of illegal settlement expansion and infrastructure development. Maali said such activities contravene international humanitarian law and Article 49 of the Fourth Geneva Convention. Hebrew TV channel 7 on Saturday evening reported that the Israeli Minister of Interior Aryeh Deri has given the green light to the planning and building institutions to prepare for the establishment of a new settlement city in Qalqilya. This project comes months after the Israeli government backtracked on a plan to expand settlements in Qalqilya. 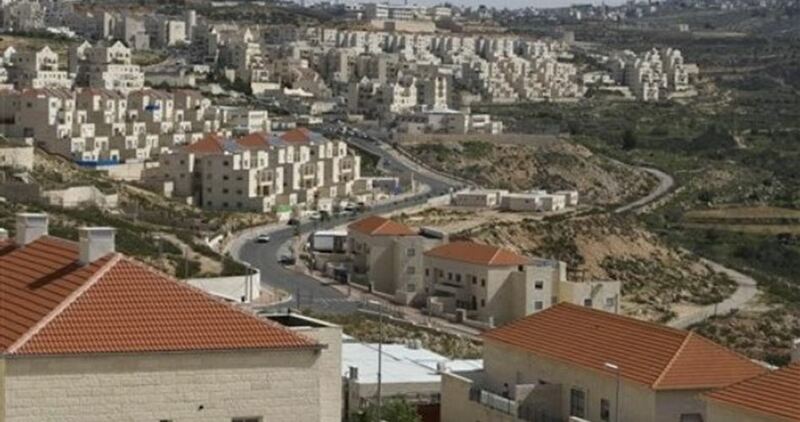 The Hebrew channel said that the city will include in the first phase three settlements to the southwest of Qalqilya city resulting from bringing four settlements together with a population of more than 20,000 settlers. The settlements in question are Sheari Tikva, Etz Efraim and Elkana. A forth settlement called Oranit to be added in the future. The Interior Minister will recommend these settlement blocs to be fused before the elections to be held in October 2018. 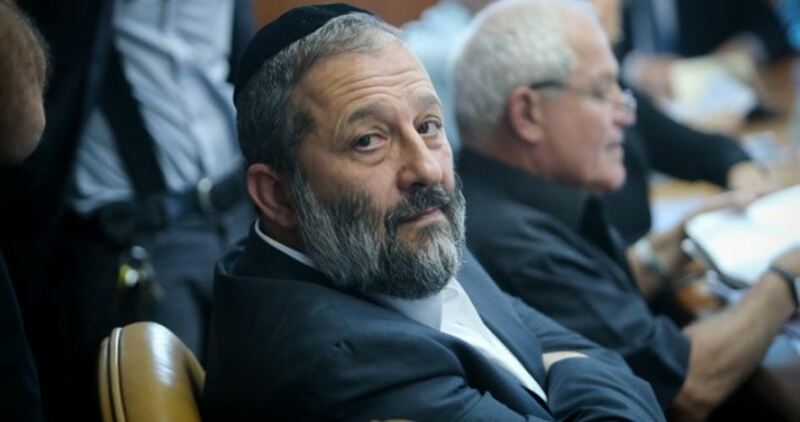 According to Deri, by 2023 Oranit settlement will be annexed to the new settlement bloc which will be then officially declared as a city in the occupied West Bank. Channel 7 said that Deri's initiative is supported by all heads of the settlement blocs included in the project. They believe that the initiative will achieve optimal utilization of the Palestinian lands confiscated for settlement expansion. Israeli police on Saturday handed a demolition order to the family of the Palestinian martyr Hussein Abu Ghosh, from the occupied city of Jerusalem. Abu Ghosh was killed after he had carried out, along with another martyr, an anti-occupation stabbing attack in Beit Horon area west of Ramallah in January, 2016. The order was handed to the family after storming Qalandiya refugee camp to the north of occupied Jerusalem and breaking into the home of the martyr. 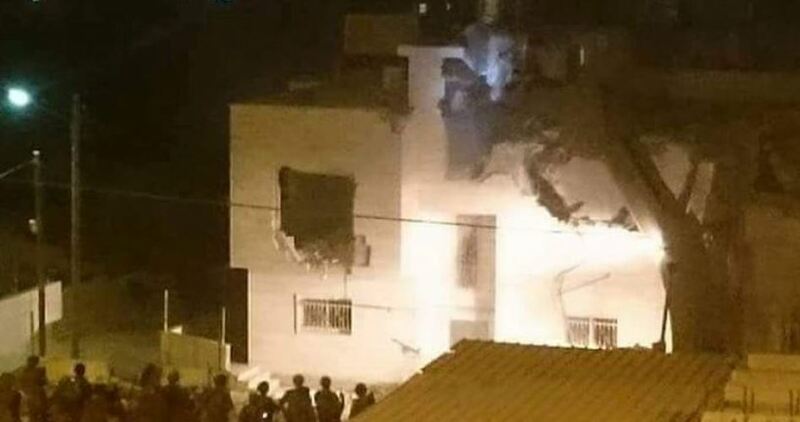 Israeli bulldozers on Wednesday night demolished a Palestinian home in al-Khalil city, south of the occupied West Bank, at the pretext of unlicensed construction. According to Quds Press, bulldozers escorted by a large number of Israeli troops stormed and cordoned off Wadi al-Kaf area to the northwest of al-Khalil and obstructed the movement of local residents and cars. The bulldozers demolished a three-story house under construction belonging to Anwar Sanqaret, claiming the building was not licensed. Consequently, sporadic skirmishes took place around the area between Palestinian young men and Israeli soldiers, who fired tear gas grenades to disperse them. 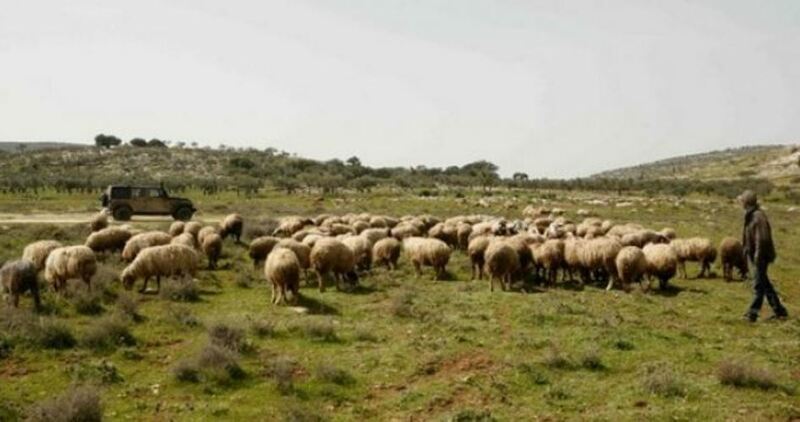 A group of settlers stole on Wednesday dozens of sheep in Iraq Burin town, southwest of Nablus to the north of West Bank. According to the local activist Ghassan Daghlas, settlers from the illegal Bracha settlement stole nearly 50 sheep owned by Amir Qadous after assaulting him. Raising sheep is often the only source of income for Palestinian herders. Israeli bulldozers on Wednesday demolished a Palestinian house in Lod city in the 1948 occupied Palestine under the pretext of being built without a permit. 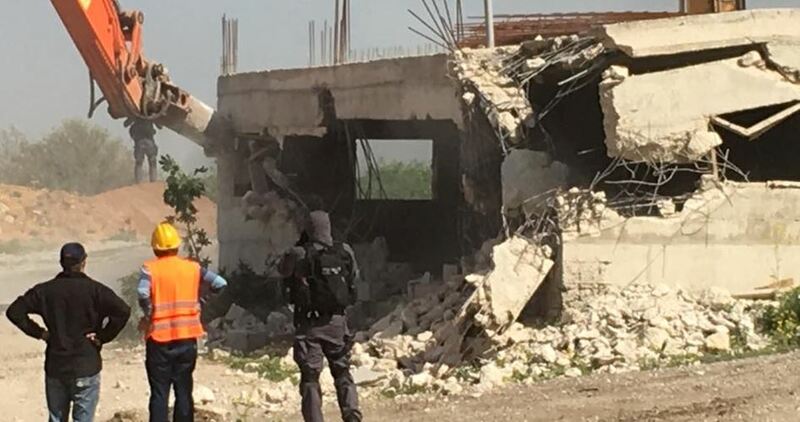 Local sources reported that the Israeli police forces stormed al-Mahatta neighborhood in Lod and demolished a house under construction owned by Martin Baidas. Member of the Lod Popular Committee Ayman Shreiki told Quds Press that Baidas was surprised by the Israeli bulldozers storming the neighborhood and demolishing his house without prior notice despite the fact that he had completed all procedures needed to obtain a license and freeze the demolition order. Shreiki said that the Israeli authorities crack down on Palestinian citizens in Lod, refuse to issue them building permits, and work, on the other hand, to expand Jewish neighborhoods in the city. Al-Mahatta (station) neighborhood is one of the most ancient neighborhoods in Lod. It has this name because of the train station which was established there during the Ottoman era to link train stations in northern, central and southern Palestine. 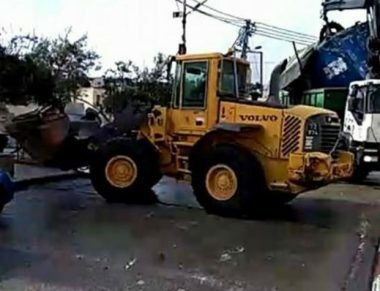 Israeli municipal crews stormed Wednesday Beit Safafa village south of occupied Jerusalem along with a number of bulldozers. 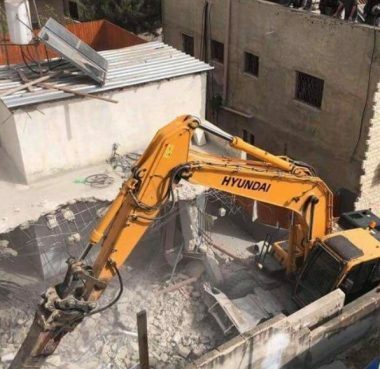 According to Quds Press, the municipal crews started demolishing a local house belonging to the citizen Awad Zawahra for allegedly being built without Israeli permit. Since 1967, Israel’s stated goal in Jerusalem is to maintain a Jewish demographic majority in the city. Towards this end, Israel has introduced a series of discriminatory policies that specifically target Palestinian residents living in occupied Jerusalem. These policies are designed to reduce the size of the Palestinian population living in the occupied city and facilitate Israeli settlement expansion. These policies resulted in population displacement, expulsions and home demolition. 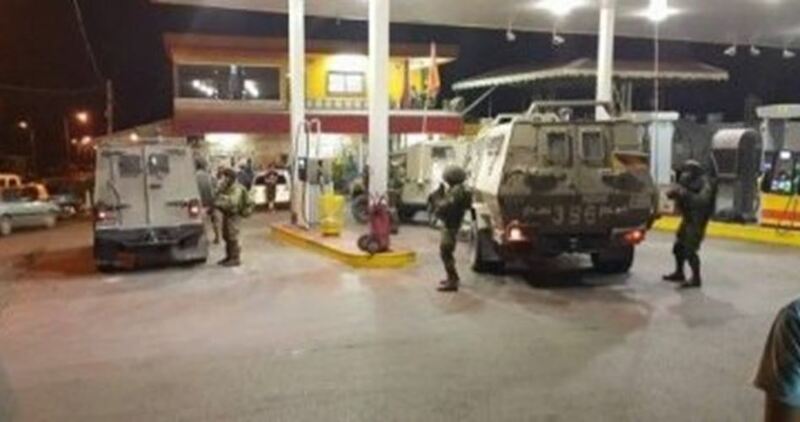 The Israeli occupation forces (IOF) on Monday stormed al-Qaisi gas station on the Tulkarem-Nablus road, east of Tulkarem city, and confiscated its security surveillance recordings. Hasan al-Qaisi, owner of the station, said that several soldiers raided and ransacked the station before seizing CCTV camera recordings, adding that they did not explain why they took such action. The IOF recently confiscated several such recordings from Palestinian-owned businesses in different areas of Tulkarem. In the past few days, the IOF arrested several Palestinian citizens in different areas of Tulkarem, especially in Anabta town, after an Israeli patrol car came under gunfire attack in a nearby area. Preparations are underway to establish a new network of roads to expand existing settlements and pave the way for the construction of new ones in implementation of the so-called "Greater Jerusalem" project which will swallow more than 10% of the occupied West Bank. Greater Jerusalem is a term used to describe the area encompassing the approximately 100 square miles surrounding the Old City of Jerusalem. Specialist in settlement affairs Ahmad Sab-Laban told the PIC reporter that the Israeli authorities are working to create a series of settlement roads deep inside Jerusalem's neighborhoods in a prelude to expanding existing settlements, building new ones and connecting them together. 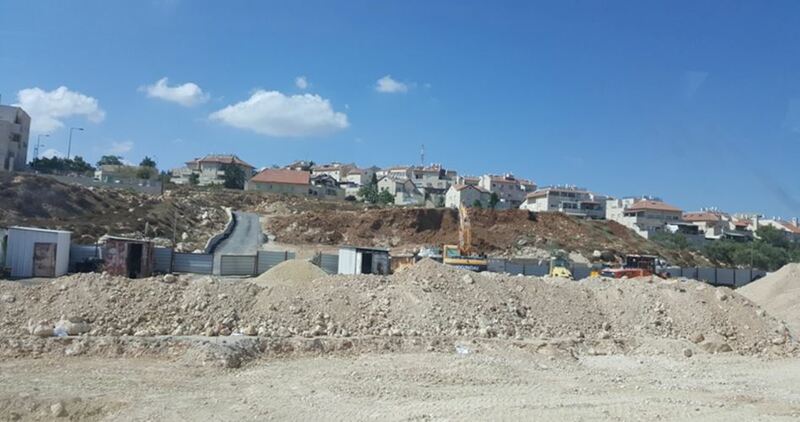 Sab-Laban said that this project will entail the confiscation of large areas of privately-owned lands especially in Shu'fat and Beit Hanina villages. He added that the daily needs of the Palestinian people in East Jerusalem have been linked to the infrastructure network Israel will provide to the settlements through the new roads. He affirmed that the roads being constructed at this stage will serve existing settlements and settlements to be expanded in the future under "Greater Jerusalem" scheme in an attempt to impose a fait accompli that cannot be changed in any future negotiations with the Palestinians. 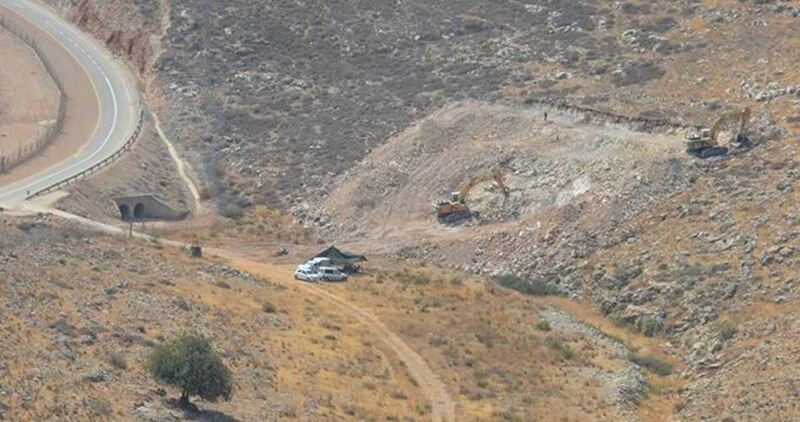 Jewish settlers escorted by soldiers on Monday stormed Wadi Qana area, northwest of Salfit, and embarked on demolishing agricultural structures belonging to Palestinian farmers. 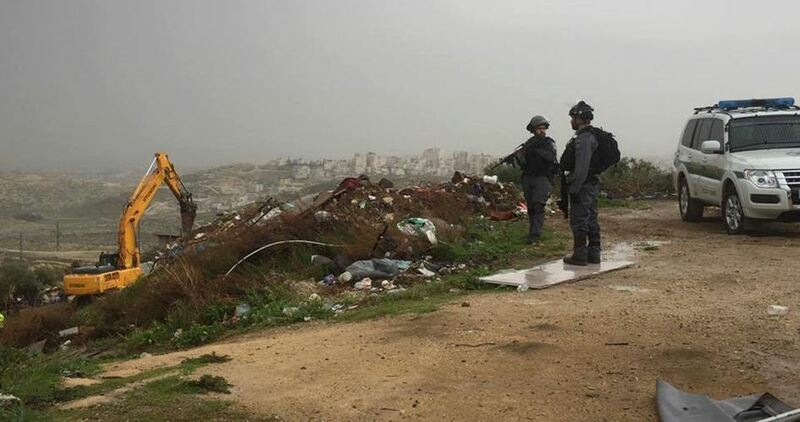 Local sources told the Palestinian Information Center (PIC) that Israeli soldiers escorting settlers claiming to be from an environmental protection committee demolished two agricultural structures, amid fears of their intent to remove more buildings. According to the sources, the Israeli occupation authority (IOA) always justifies such demolitions by claiming that the area is an agricultural reserve where changes and construction activities made by the locals are not allowed. Over the past years, the IOF and settlers destroyed and uprooted thousands of olive trees and saplings in the area under the same pretext. 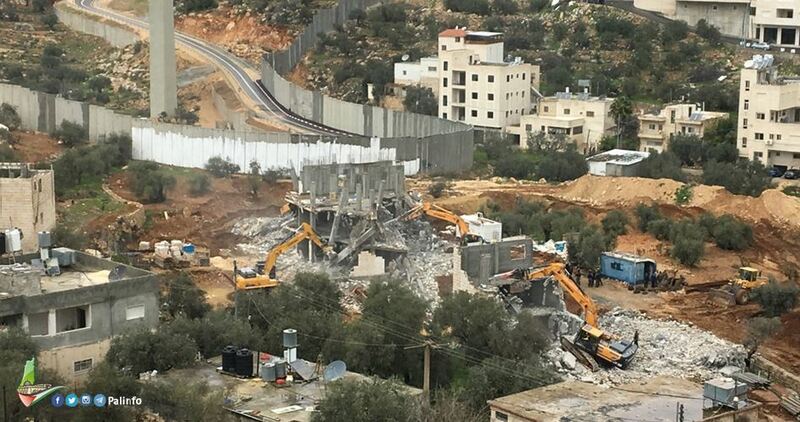 In this regard, Palestinian researcher Khaled Ma’aali said that the IOA had already threatened to raze several structures in Wadi Qana at the pretext that local framers violated the law by renovating and making changes to those structures. Wadi Qana is encircled by eight illegal settlements encroaching slowly on what has remained of it, while Israel tries hard to impose restrictions on the local farmers to prevent them from developing and working their agricultural lands and force them to leave the area. A group of extremist Israeli colonialist settlers installed, Monday, a new outpost on Palestinian lands, south of Beita village, southeast of the northern West Bank city of Nablus. 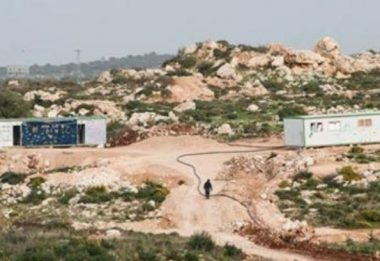 Fuad Ma’ali, the head of Beita Local Council, said the colonialists installed four mobile homes on four dunams of Palestinian lands, owned by a local Palestinian, identified as Mousa Abdul-Mo’ti, and even hooked them with electricity and placed floodlights around them. The settlers also brought bulldozers, and initiated infrastructure work to hook their new illegal outpost with running water. Fateh movement in the West Bank called for resisting Israel’s illegal colonialist activities, and its ongoing occupation of Palestine, as they are constant violations of International Law, and the Four Geneva Convention. The Palestinians in Beita called on the International Community to intervene, and end the Israeli violations against them, as they live in areas under full Israeli military control, and are deprived of basic services. The Israeli government coalition on Sunday intends to explore the possibility of backing new legislation at the Knesset calling for annexing illegal settlements in the West Bank to Israel’s sovereignty. The legislation, which was drafted by Knesset members Yoav Kisch (Likud) and Bezalel Smotrich (Jewish Home), seeks to impose Israeli sovereignty over Jewish settlements in the occupied West Bank, which are currently under military rule. The meeting is intended to explore whether to push forward the settlement annexation bill at the Knesset or shelve it for the time being to avoid angry international reactions, which could not be in Israel’s favor. Israeli Occupation Forces (IOF) on Saturday banned Palestinian workers from renovating a Palestinian home of Haj Mufid al-Sharabati in al-Shuhada Street in Central al-Khalil and confiscated their tools. The brother of the home owner, Ziyad, said that a group of Jewish settlers attacked the house amid cursing of the workers and the family. The settlers threatened them with assaults in case of the continuation of renovation works. The settlers immediately summoned IOF soldiers and the so called civil administration officers who banned the workers from restoring the house and seized their equipment, according to WAFA news agency. Ziedan revealed that his family consists of 20 members who are always subjected to harassment from settlers and IOF soldiers in order to make them leave their properties for settlers of Beit Hadas settlement which is located in the opposite side of their home. 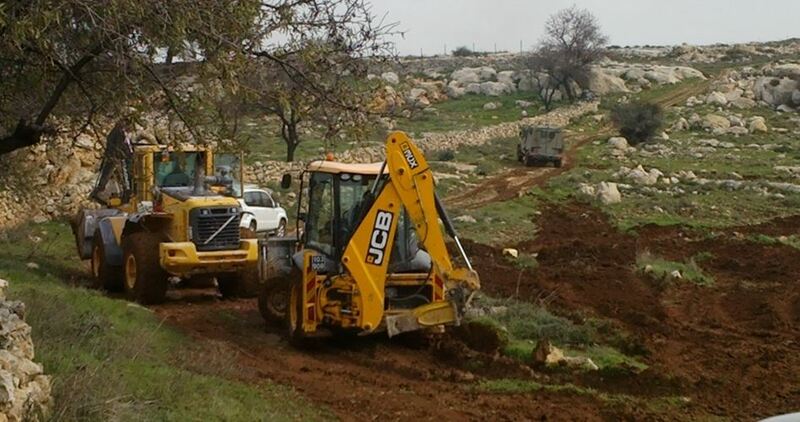 Eyewitnesses reported that Israeli bulldozers on Saturday morning razed Palestinian lands north of Bruqin town in Salfit province in favor of the expansion of Bruchin settlement. They added that the industrial area of Ariel settlement is also being expanded in the western area of Bruqin at the expense of Palestinian farmlands. Anti-settlement researcher Khalid Ma'ali said that the Israeli bulldozing operations are in full swing in different villages and towns of Salfit including the four industrial areas located to the north and west of the province. Ma'ali stressed that Israel's settlement expansion activity on occupied Palestinian territories is illegal under international humanitarian law. Israeli bulldozers on Wednesday demolished a residential structure in Silwan town to the south of al-Aqsa Mosque. The Jerusalemite Mahmoud Temeh said that Israeli forces demolished his son’s home in Ain al-Lawzeh neighborhood in the town at the pretext of lacking a construction permit. He said that the demolition of the house, which area was estimated at 110 square meters, has led to the displacement of his son’s family which consists of 6 members including children. He revealed that his son paid a sum of 100,000 shekels (29,000 dollars) as fines in an attempt to avoid the demolition order. Israeli soldiers demolished, Wednesday, a Palestinian home in Wadi Yasoul neighborhood, in Silwan town, south of the Al-Aqsa Mosque, in occupied Jerusalem. The WAFA Palestinian News Agency said the demolished home was owned by members of an-Na’imi family. The army said the property was built without a construction permit, while the family has been filing appeals with courts in an attempt to save their property. In related news, the soldiers removed an Residential Vehicle (RV) owned by Mazen Shweiki and his family, after the soldiers previously demolished his home in Beit Hanina, north of Jerusalem.